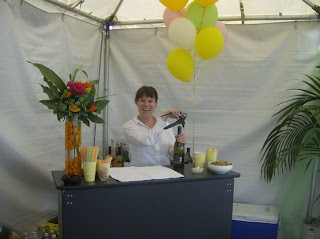 At a summer party, fresh fruits add a whimsical touch…. this bar floral has orange halves placed in among the flowers and the vase is filled with kumquats. 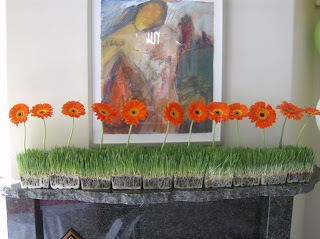 To brighten up this granite mantle, we chose orange gerbera daisies sprouting up from a hedge of wheat grass. 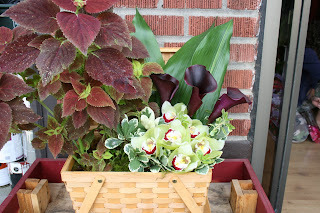 A natural wood picnic basket is overflowing with a potted coleus plant on one side and a lush vase of plum mini callas and green cymbidium orchids on the other. A great addition to that labor day barbeque. 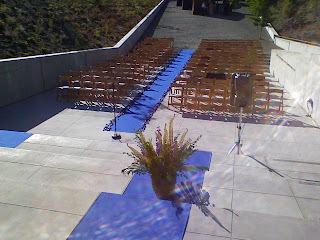 Olympic Sculpture Park: for a dramatic burst of color, this royal blue aisle runner lines not only the ceremony aisle but continues up the steps to the pavillion. Black river rock lines each side of the runner at the ceremony area and large floral arrangements are placed on the steps. Ring bearer’s pillow: this is a great alternative to the traditional satin pillows used to carry the bride and groom’s rings. These flower pillows are adorable and hold up well. We can create them in almost any color using tiny button mums. Simply untie, slip the rings down the ribbon and re-tie the bow. Can I use this photo and link back to you on my blog? ?